I am vegetarian but have been only for about 20 years. Before that, I was someone who loved chicken and bacon! I loved it so much that a friend took a bet with me that I couldn't be vegetarian for 3 months - I did it and found it so easy that I just stayed vegetarian - and have no regrets. I do, though, frequently make chicken or fish for my husband and daughter, who are consummate non-vegetarians! This is one that is (I hear!) finger-looking good. Chettinad cuisine is famous for its use of a variety of spices used in preparing mainly non-vegetarian food. The dishes are hot and pungent with fresh ground masalas, and topped with a boiled egg that is usually considered an essential part of a meal. They also use a variety of sun dried meats and salted vegetables, reflecting the dry environment of the region. The meat is restricted to fish, prawn, lobster, crab, chicken and mutton. Chettiars do not eat beef and pork. Marinate chicken for at least 4 hours, or overnight. In a little oil, add the bay leaves, ground paste and salt and saute. Add turmeric and marinated chicken and 1/4 cup water. Enjoy the chicken curry with rice or over idiyappams. Jihva for Love made me think immediately of my mother. My mother was and is my inspiration to cook. I don't think I'll ever be as creative and adventurous in my cooking as she is, but I strive to be. Growing up, we took her cooking for granted. I didn't pay attention when my friends would love to come over and actually ask my mom to make their favorites. Every week my mom would try out one or two new dishes on us. We were exposed to international foods very early in our lives. Tacos, home-made pizzas, noodles, pasta, cheese-baked vegetables...the list goes on. She got us to love soups and salads, and to taste everything. Our palettes became quite refined as we grew older. Sundays were always family time. For about 40 years (I hear! ), we've had the exact same menu for breakfast and lunch on Sunday. FORTY years! And we look forward to it every sunday! Breakfast is always dosas with small onion sambar, coconut chutney and milagai podi (a spicy powder made with roasted lentils and chillies). Lunch is always small, spicy potatoes, rasam, and peas (or sometimes if peas weren't available, carrot). When I moved to the US, I'd make my sunday lunch as a special treat for myself when I was home-sick, or needed comforting. It always reminded me of home and of my mother. I have now continued this tradition in my house. And I try very hard to make my daughter as exposed to international foods as I was. Every sunday though, our menu doesn't change. And I hope I can carry on the tradition. And I hope my daughter's friends will soon be asking me for their favorites! This is the potatoes we always made at home - its very near and dear to my heart for it will always represent sundays with my family, reading the newspaper and chatting about the week. Pierce each potato with a fork once or twice, and cook in salted water. Remove when they are parboiled or slightly resistant to a knife. Heat oil in a pan. Saute the garlic, curry leaves and chilli powder for about 2-3 minutes (or until the raw smell of garlic has disappeared). Add the potatoes and toss to coat with the spices. Continue cooking on a low heat, until the potatoes are cooked through. *(Sometimes I use crushed red pepper instead of chilli powder, and that tastes great too). Here's to family food traditions. Lightly beat eggs. Whisk in milk and sugar. Melt 1/2 the butter in a pan. 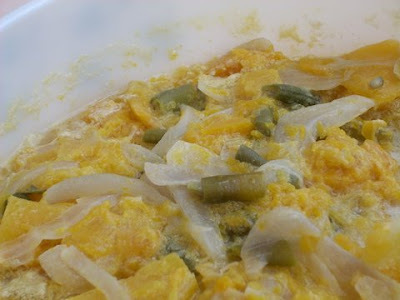 Add a slice of bread to the egg mixture. Turn the bread and allow to become saturated. Place in the pan and brown on both sides. This is my entry for the Food for Plastic Challenge III, hosted by What's Cooking?. Tupperware has named April "Children's Month" and will be donating part of their proceeds to Boys' and Girls' Clubs. The Taste of Yellow, hosted by Barbara, is an event which, along with the Lance Armstrong Foundation, helps support those who live with the effects of cancer. This is such a great cause, I urge everyone who is reading this to participate. In a pan, heat oil and add the ingredients for tempering. When the mustard seeds begin to splutter, add the turmeric powder, lemon juice and salt and leave till just heated through (do not leave on for more than a minute, as the juice tends to become bitter if heated for too long). Remove from heat and toss with the cooked rice. In honor of Vishu, I wanted to post my favorite Keralite dish. The very first time I tasted this dish I fell in love with it. I've made it many times since, and it comes out perfectly every time. Its really simple and a lovely tribute to Kerala food, thats always slightly sweet and very tasty. Cook the pumpkin, chillies, onion and curry leaves in a little water (just enough water to cook the pumpkin). When the pumpkin is cooked and soft, add salt. Continue cooking until the dish thickens. When the curry is thick, add the coconut milk and oil. Let it heat together on a low flame for another minute or two. Remove from heat. Originally from Karnataka, this "roti" is close to a thin adai. Akki means Rice in Kannada, and these are thick, soft rice crepes. I've loved these rotis (pronounced "rotti") ever since I was a little girl and would get them for breakfast when I holidayed with my grandparents in Bangalore. Easy to make and packed with flavor, these are great for a hearty breakfast or brunch. In the original recipe, you would essentially make a dough and pat the dough onto a pan to form a thick rotti/ tortilla. But I like them thin and crispy - and so, I made a batter rather than a dough by mixing in lots of water to make it of pouring consistency. Mix all the ingredients with a little oil in warm water. I added enough water to make a thin batter. Spread some oil on a heated pan and pour a 1/4 cupful onto the pan. Cover and let steam. Turn over and drizzle some oil on top. Cook well on both sides till golden brown. I love to eat it all by itself. But it tastes very good with a mild chutney. I'm sending this one to Srivalli @ Cooking4allseasons for the Dosa Mela. This is the last one, I promise. As you can see, I'm a dosa freak too, Srivalli! Originating from Coorg and Mangalore, Neer Dosa is a light, soft dosa. At first it seems really easy to make, but getting that soft consistency proved to be quite an uphill task. Finally we managed to make some pretty decent ones. Wash and soak the rice for 2-3 hours (I soaked it overnight). Then grind to a very thin paste. Remove from the grinder and add salt and water to make a very thin consistency. (And when it says thin, it has to be just a little thicker than water! Otherwise, it just doesn't get cooked on the dosa pan.).. Heat the dosa tava, apply a little oil and pour one ladleful of batter so it spreads in a thin, even layer. Cover and keep for a second. Then remove it carefully. They were quite lovely towards the end! I served it with coconut chutney and tomato curry. This is for Valli's Dosa Mela at Cooking4allseasons. Rasam, I find, is one of those things that you can't cook by recipe alone. There has to be a feel for the dish, an innate sense of what and how much goes in. I've always been a cook of proportions, preferring to follow recipes, and so, my rasams were never fabulous (or ever measured up to what I had growing up). A friend gave me a cookbook when I left for the US to study, and said "read it when you are feeling homesick". I didn't take it out for almost 3 months and then one day, I desperately wanted rasam. I tried this book and it was the best I've ever had. Rasam is a thin, slightly spicy soup with a lentil base. It is delicious mixed with rice, but tastes as good just as a drink. Heat the oil and add the tempering ingredients. When the mustard starts to splutter, add the tomatoes, jaggery/sugar, tamarind extract, mysore rasam powder, salt and turmeric. Keep on a low flame and let it simmer until the raw tamarind smell disappears. Add the cooked dal and let it simmer for another 5 or so minutes. Add the coconut milk, coriander and remove from heat. Roast the coriander seeds, peppercorns, cumin, fenugreek and curry leaves on a dry pan. In another pan, fry the red chillies in the oil. 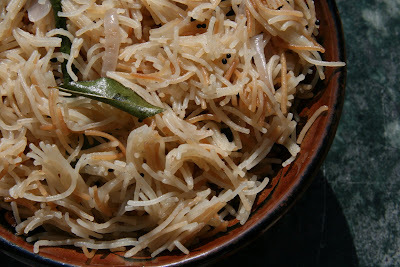 Vermicelli (or Semiya as it is known in southern India), is a versatile ingredient used in different types of foods. Most popularly it is used in kheer or payasam (a sweet dessert pudding) and in upma. 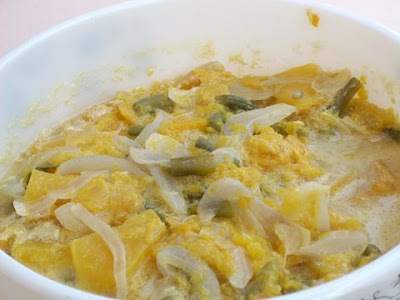 Sometimes, it is even used as a substitute for rice in a yogurt-rice mix. It looks and feels like a thin rice noodle, and is probably the closest thing that India has to the noodle. Here, I've made a semiya upma. A very popular breakfast food in several parts of India, and a huge favorite of mine. Add a tablespoon of oil to a saute pan. When the oil is warm, add the mustard seeds. When the mustard starts to splutter, add the curry leaves, green chillies and onions and fry for a couple of minutes. Add the water and salt to the pan and let it come to a boil. Now add the vermicelli and keep stirring. The water will be absorbed and the vermicelli noodles will become soft. Remove from heat. This is my entry for Presto Pasta Night. 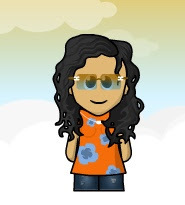 Check out some of the recipes - they're delicious. 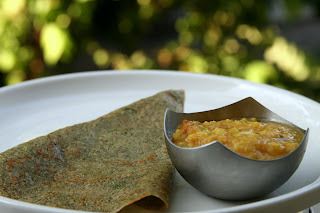 Pesarat is a dosa made of green gram lentils and is absolutely delicious and nutritious. I'm always looking for ways to make my favorite staples healthier and tastier, and this combines both. The green gram provides a big protein punch, which is so important to us vegetarians. And it adds a bit of a nutty texture to regular dosa, which, to me, makes it tastier as well. Grind the lentils to a pancake dough-type consistency with a little water. Add the chopped green chillies, onions and coriander. Spread like crepes on a heated pan. Turn over when slightly brown and cook the other side for a minute or two.